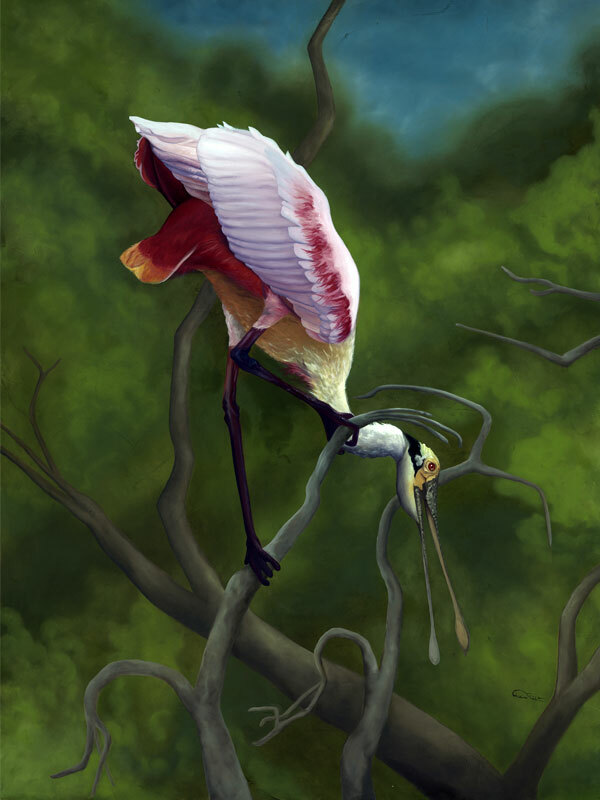 Spoonbill Original Artwork "Twisted Point of View"
This upside down Roseate Spoonbill original artwork is for sale as a 48h x 36w gallery wrapped canvas. The original artwork features an impasto look for creating an additional light and shadow. Roseate Spoonbills do not seem to have a problem talking to other birds and animals around them. They twist and turn their bodies like acrobats to be able to have a better vantage point in which to chat. Their bodies ability to turn this way and that almost mimics the branches that they love to perch in. The branches themselves are filled with curves and twists. I like to create a rhythm in my paintings. If a bird feels quite curvy, I enjoy placing them atop branches that mimic the posture. In this scene, I depicted one of those acrobatic birds hanging upside down in able to see and talk to the other birds around it. The focus on the bird and twisted branches gives the piece a playful feel. Whether just starting your art collection or looking to add a new beauty to your your current collection, the “Twisted” one-of-a-kind artist signed original is available to purchase below. Appreciate this artist crafted, detailed, oil on canvas original artwork in your own home. “Twisted” brings an incomparable charm that can bring some of the elements of nature indoors. Whether adding a sense of escape to the office, enriching the home, or adding some extra flavor to that special vacation retreat, your new artist signed giclee can even more life to your interior space.